More than a quarter million Americans die from it each year, more than succumb to heart attacks. U.S. hospitals spend an estimated $55 million a day battling it. Most Americans know next to nothing about it, and all too many medical caregivers fail to recognize its fast-moving symptoms that can lead to death. Leaders at the federal Centers for Disease Control and Prevention have grown so wary of its health and economic toll that they have declared a medical emergency over this disease. Its name is sepsis. Sepsis often starts in children younger than 1 and adults older than 65 with infections to the lungs, urinary tract, skin, and gut. Patients display infection-related symptoms including: diarrhea, vomiting, sore throat, as well as shivering, fever, or feeling very cold, extreme pain or discomfort, clammy or sweaty skin, confusion or disorientation, shortness of breath, and a high heart rate. Doctors say that low blood pressure, areas of hot, reddened skin, pain, and confusion that won’t lift are all red alerts that sepsis may be occurring. Almost three-quarters of patients with sepsis are seen by doctors and nurses who can too often miss the symptoms of this condition, in which time is life-and-death. Failure to treat sepsis quickly, perhaps within hours, and aggressively with antibiotics and other means can condemn patients to progress to deadly septic shock. As the CDC video (above) describes in one case involving a teen, sepsis occurs with stunning, lightning speed. When egregious enough, these instances of misdiagnosis can amount to medical malpractice and prompt lawsuits by which grieving survivors hold accountable the health care providers who were asleep at the switch. I’ve written about how sepsis, blamed in the death of Muppets creator Jim Henson, claimed the lives of two notables recently: actress Patty Duke and boxing superstar Muhammad Ali. When both these celebrities died, advocates expressed the hope that greater awareness might be generated to reduce sepsis’ harm. Besides conducting a public information campaign, especially for parents, caregivers, and medical personnel, the CDC is urging Americans to help combat sepsis by getting vaccinated against the flu, pneumonia (for seniors), and meningitis (for young people). 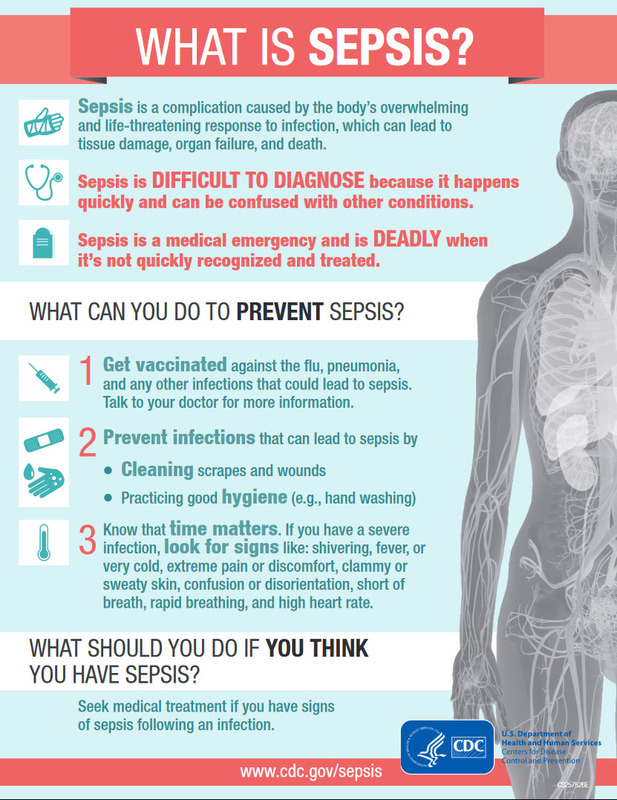 Hygiene, especially, in hospitals can be key to battling sepsis. 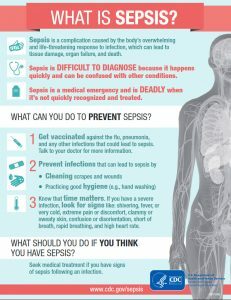 It’s especially important, however, for members of the public to be informed about sepsis, its symptoms, and how to treat it fast because the CDC estimates that 80 percent of the incidences of this condition start outside hospitals. These infections also are blamed for a significant number of hospital readmissions.